Our way of life was revolutionized with the invention of several modes of transportation. Our streets are filled with cars, trucks, and vans. Trains zoom from place to place across cities and countries. Our skies are no longer just for the birds! It’s time to buckle up and get moving! How Do Airplanes Fly? Do All Trains Run Aboveground? All aboard! Next stop: Wonder Junction, where we're trekking across the globe by land, air, and sea with transportation Wonders! Get ready to roll with this activity! Use different materials to assemble your own speedster. Designate a length of area in the room to be used as a race track. This can be as simple or elaborate as you'd like, but be sure to designate a starting line. Using trial and error, find a way to make your car move independently by using the materials provided in the supply list. Use your imagination and try out different materials to see what moves your car the farthest. Once you've found a method that moves your car, place it on the race track and launch it to see how far it travels. Use masking tape to record where it stops on the floor. Modify your car's design to see if you can get it to travel farther. Which materials worked better than others at moving your car? Why do you think certain materials worked better than others? What were some of your initial thoughts on how to make your car go? As you add materials to your car, some of them will transfer energy to the car, which in turn moves the wheels and propels the car forward. Your design helps turn potential energy into kinetic energy! Search around your house for more supplies to test. Are there any kitchen utensils you could test? 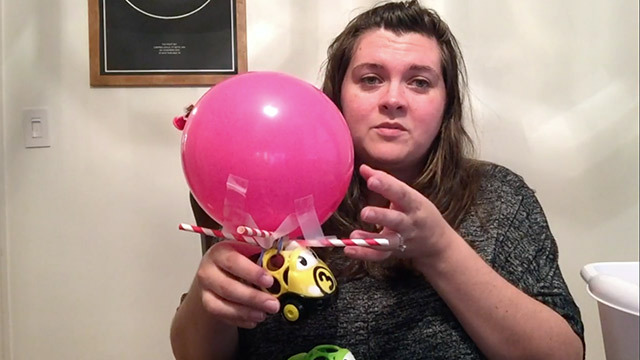 Do some Internet research to find instructions on building a simple motor for your toy car! This activity was provided by Taylor County Public Library in Campbellsville, Kentucky.